The North Sea would be in much better shape if it'd heeded calls to cut costs when prices were sky high, according to PwC. As if North Sea companies weren’t already rueing their inability to stay lean and trim when oil was selling for more than $100 (£65) a barrel, a report today that hammered that failure right home. Had the UK’s oil and gas firms heeded calls 12 to 18 months ago to cut costs by 30%-40%, they ‘would have been in a much better place to weather the oil price maelstrom,’ accountancy giant PwC said. ‘The stark reality is that firms need to be able to operate in an environment where oil averages at $50 per barrel,’ its oil and gas capital projects director Brian Campbell said. Brent Crude (the North Sea benchmark oil) is currently selling for just under $56 and PwC estimates a British one costs an average of $65-$75 to pump out. What PwC is saying isn’t exactly rocket science and cost-cutting of that magnitude is one hell of a tall order – especially when you remember that no one saw the 60% plunge in oil prices coming. They do have a point, though: ‘viewing lower oil prices as a catalyst for driving change may not be a bad starting point,’ as Kevin Reynard, its senior Aberdeen partner, put it. But oil majors do need to take care, he said, that they don’t cut the fat too far, too fast. If the remaining 15-16 billion barrels under the North Sea are to be recovered, companies have to ‘escape short term knee jerk reactions that could wipe out knowledge banks and turn-off suppliers’. Shell, BP, Conoco Philips, Talisman and others have already announced hundreds of UK job cuts and slashed investment budgets - perhaps proving they haven't moved away from the short-termism that has already screwed them over. Those job losses are mostly onshore so far, though, and production-wise it seemed to be business as usual in Aberdeen when MT visited last week. 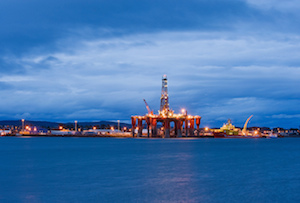 But there was a definite ‘calm before the storm’ vibe, and if companies get their cost-cutting act together properly the worst will be yet to come for the North Sea.